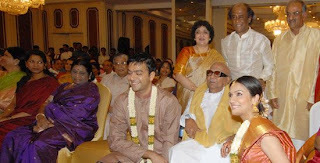 Kollywood Superstar Rajinikanth's younger daughter Soundarya Rajinikanth gets engaged with Ashwin Ramkumar son of Ramkumar who is the famous businessman runs a construction company in Chennai on Wednesday, February 17, 2010 at Park Sheraton Hotel in Chennai. Ashwin Kumar did Master Degree from the prestigious Stanford University in USA and now works with his father in the construction company. Both were felt in love, when Soundarya met Ashwin in Goa during shooting. Tamilnadu Chief Minister Mr. M. Karunanidhi and AIADMK Leader Miss Jayalalitha attended the function. The whole kollywood industry like directors, producers, music directors, actors & actresses and other technicians participated in this grand occasion. The wedding will be in the next month, the sources said.